The Legendary Pink Dots - "Your Children Placate You From Premature Graves"
While I can't say that I've heard the entire Pink Dots catalogue, I've certainly heard enough to say there's something different about their latest release, Your Children Placate You From Premature Graves. Amidst the usual foreboding lyrics, Krautrock like soundscapes, acoustic and electric guitars, and electronic rhythms, there is an unusual warmth to this album. To be sure, it is infused with an air of melancholy. It is, as the album title suggests, like experiencing the memory of a lost child, smiling at the good memories, but feeling the pain of absence and loss. From the opening, music box like melody of Count on Me to the closing nostalgic ambience of Your Number Is Up (which reprises the melody from the opening track), the album flows from one track to the next, exploring Pink Floydian like sonic realms from the Syd Barrett-like English psychedelia of Feathers At Dawn to the spacey acoustic The Island of Our Dreams, which would not have been out of place on an album like Meddle or Obscured By Clouds. But this is no Floyd Pastiche. Other places, Ka-Spel and company get into some Kraftwerk/Neu!-style rhythmic jams, like the superb The Made Man's Manifesto and some spacey ambient explorations like A Silver Thread. This may not be as dark or challenging a work as some of their other albums, but that's not necessarily a bad thing. This is The Legendary Pink Dots, unique as always, but in a slightly more accessible form. It's a warmer, dreamier, more inviting sound than usual, but there's still the powerful sense that they are doing their own thing, as always. This just happens to be where their thing has led them to on this album. 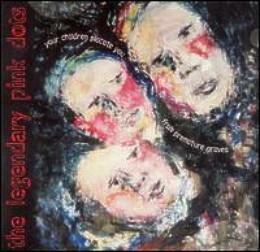 For more information you can visit The Legendary Pink Dots web site at: http://www.legendarypinkdots.org. Visit the ROIR web site at: http://www.roir-usa.com.